Like the Great Lakes in North America, the Black Sea is almost completely land bound. Where lowlands abut the sea, sloshing during the hour of the pole shift and for hours afterwards will roll inland for some distance, particularly up rivers that feed into the sea. This will prevent those rivers from draining, thus they will also flood their banks to an immense degree. Residents in coastal areas should seek high land, in the mountains within reach, prior to the shift. Those in the high lands of Hungary and Turkey will find tidal bore on occasion happening, so should move inland somewhat, past the first mountain range abutting the sea, for safety. Large plates have their weak spots, as an analysis of the St. Lawrence Seaway in the N American Continent shows. When this tears open, it rumples all the way to the Black Hills of S Dakota. The S American Plate is tearing open somewhat at Buenos Aires, and in N America likewise where the Mississippi River empties into the Gulf there is weakness all the way to where the river bed meets the deep great lakes region. We have mentioned that a new seaway will develop from Karachi inland in Pakistan, tearing up into the deep lakes in Russia's interior. It is no accident that these deep lakes are often along such tear zones, as this is where the plates themselves have a separation in the rock strata. 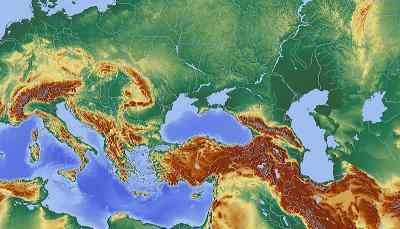 Likewise for the Black Sea, which is deep, as there is a line of river beds that stretch from the Black Sea all the way to the Arctic. Where such deep lakes exist, there are openings to volcanic vents. Thus, such deep lakes, where normally cold, can have their own heat sources. Since the Eurasian Plate will be pulling apart, building a new seaway at Karachi, and even the twisting of the Arabian Plate at Iraq in essence relieving pressure above Iraq, this should not cause problems for those living around the Black Sea. Other than the flooding in of sea water as the sea level rises to 675 feet above today's level, those living on her shores should not experience problems.